The main objective of this report is to analysis Prospects of Mushroom in Bangladesh. Other objectives of this report are to create awareness about the Mushroom among people, to know and explore the cultivation in Bangladesh, to make our economy strong by exporting Mushroom product, to learn some important aspects like Management aspects- a controlled management, Marketing aspects- make profit with consumer satisfaction, financial aspects- arrange the financial support, and Socio-economic aspects- make people aware about good or bad products with reasonable price. Mushroom is a large reproductive structure of edible fungi, which is the most popular nutritious, delicious and medicinal vegetable in the world. It is now one of the promising concepts for crop diversification in Bangladesh. The climatic condition of Bangladesh is completely suitable for mushroom cultivation. It does not require any cultivable land. It can grow in room by racking vertically. Therefore, its yield as well as benefit per unit area is higher than any other vegetable in our country. It requires short time, little capital and easy technique for cultivation. This is why all types of people like male and female, youth and old even children and disabled can easily participate in its cultivation. Therefore, it can generate huge scope of employment opportunities for unemployed people. The raw materials for mushroom cultivation like sawdust, paddy straw, wheat straw, sugar can baggage, waste paper, used cotton, dervishes etc are very cheap and available in our country and no materials are required to import from abroad for its cultivation. Moreover, no chemical is necessary for its cultivation, therefore it is completely organic and eco-friendly. Used substrate of mushroom cultivation is one of the best sources of organic matter in the soil. Its cultivation may be “a lifeboat” for survival of the landless people who do not have any source other than their houses and own labor. Its cultivation can transfer as a cottage industry and create a goods opportunity for export. A Mushroom is the fleshy, spore-bearing body of a fungus, typically produced above ground on soil or on its food source. The standard for the name “ Mushroom” is the cultivated white button Mushroom. Mushroom designates the entire fungus when in culture or the thallus of species forming the fruiting bodies called Mushrooms. Mushroom production can play an important role in managing farm organic wastes when agricultural and food processing by-products are used as growing media for edible fungi. The spent substrate can then be composed and applied directly back to the soil. This publication includes resources for entrepreneurs who wish to do further research. Many people are intrigued by mushroom nutritional and medicinal properties, in addition to their culinary appeal. Mushroom contains many essential amino acids. As a group, Mushroom also contains some unsaturated fatty acids; provide several of the B vitamins, and vitamin D. Mushroom are nutritious: They are a good source of B vitamins, especially niacin and riboflavin, and rank the highest among vegetables for protein content. To learn some important aspects like Management aspects- a controlled management, Marketing aspects- make profit with consumer satisfaction, financial aspects- arrange the financial support, and Socio-economic aspects- make people aware about good or bad products with reasonable price. Collected information by talking with the owners who are involved in the relevant business. Make interview with Bangladesh ‘krisi unnyan & Somprosaron kandra’ Savar. Get information from the customer by survey and direct talking. Collected information from our potential retailers about our source of goods. Secondary sources, on the other hand, offer an analysis or a restatement of primary sources. They often attempt to describe or explain primary sources. Some secondary sources not only analyze primary sources, but use them to argue a contention or to persuade the reader to hold a certain opinion. And also secondary sources are less easily defined than primary sources. A newspaper article is a primary source if it reports events, but a secondary source if it analyses and comments on those events. In science, secondary sources are those which simplify the process of finding and evaluating the primary literature. To making these reports I have collect the information from several organizations and persons who are Mushroom researchers. To realize the market situation some surveys have been held by my prepared questionnaires and some interviews were taken. Collected information’s provided by various sources are strictly checked by me. I have make some fieldworks for better understanding the practical situation. And try to compare our target with consumers needs. Mushrooms provide high protein and essential amino acids. Low in fat and high in fiber, they also provide vitamins thus stimulating the immune system. 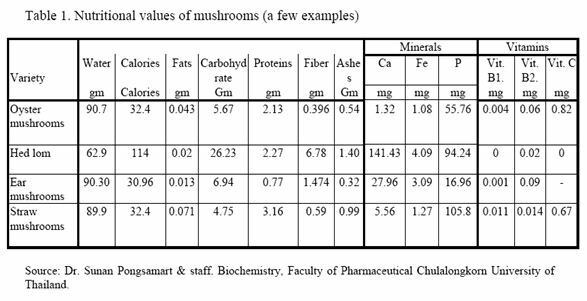 Eating two to three types of mushroom per day can provide the proper amount of essential amino acid required by the body. It also supplies high levels of protein and vitamins. Normally, one adult can consume about 200-800 gram per day. For elderly people and children, 200 and 500 grams are sufficient. There is a huge prospect of mushroom cultivation in Bangladesh. It can play an important role in eradicating malnutrition, one of the main problems of the people, and preventing diseases. By mushroom cultivation, it is possible to alleviate poverty and providing employment for educated unemployed, youths, adolescents and womenThe current small market is dominated by- Mushroom Bangla Ltd for last 2 years. Industry wide sales are expected to accelerate for at least the next 1 year. Market leader Mushroom Bangla company capture 65% of current market share. Some other organization also doing business but their market share is very low.Market demand is very high and become higher day-by-day. But there is lacking of supply. The leading firm of Bangladesh which structure the industry of Mashroom. Others 40% is capture by others small firm . So, Bangladesh mushroom industry is consists of above big to little firm. There is a huge prospect of mushroom cultivation in Bangladesh. It can play an important role in eradicating malnutrition, one of the main problems of the people, and preventing diseases. By mushroom cultivation, it is possible to alleviate poverty and providing employment for educated unemployed, youths, adolescents and women. Mushrooms can be cultivated on a small and large scale to allow personal consumption or the start of a commercial enterprise. Collected mushrooms can be sold as a supplemental or major source of income, depending on the size and number of mushroom houses. People with physical disabilities are fully capable of accomplishing all necessary tasks in mushroom cultivation, even if some modifications in constructions and equipment may be needed. Specific tasks may need to be done differently because of certain disabilities. Chronically ill or weak people can work in a cooler environment since mushrooms grow under the shade. This reduces physical exertion associated with open cultivation as with rice and small fruit. Mushroom cultivation can be performed by mentally disabled people. Several tasks required are repetitive and can easily be learned. For people interested in experimenting, the range in types of mushrooms and cultivation techniques can prove challenging and gratifying. Mushroom cultivation offers a wide range of activities most suitable for people with various needs, diverse interests and specific capabilities. Mushroom cultivation can be started at a very low cost. In the province of Ubon Ratchathani a mushroom house capable of holding 1,000 mushroom bags can be built for as little as 500 Baht (US$12) depending on the creativity of the constructor and its ability to use readily available and appropriate materials. Mushrooms can be produced and sold within 2 to 4 months. Collected mushrooms can be sold fresh in the village, on the local market or directly from the Farm. Spawns or seeds and spawn bags can be bought by the entrepreneur at a reasonably low cost allowing an acceptable profit margin. Thailand spawn is among the least expensive. Spawn bags can be produced for self-use and can also be sold, thus increasing the profit margin and generating more income. Mushroom is a very nutritious, delicious and fully ‘halal’ vegetable having medicinal qualities. Mushroom cultivation in Bangladesh began in 1979 with assistance from Japanese organization JOCDV. Later, Japan International Cooperation Agency (JAICA) came up in 1987 with its assistance. Mushroom cultivation slowed down in 1990 following withdrawal of JAICA’s support. In 2003, the government introduced a Mushroom Development Project under Agriculture Extension department. Different research works are being conducted under the project in addition to providing, training on mushroom cultivation. Apart from Savar, this project has activities in Dinajpur, Jessore, Barisal, Chittagong, Sylhet, Comilla, Khulna Mymensingh, Bandarban, Rangamati, Chapainawabganj and Rangpur fomotivating people to cultivate mushroom. Sheikh Ruhul Amin, director of the Mushroom Development Project, says currently 13 species of mushroom are cultivated in Bangladesh of which yester Mushroom is produced commercially to a large extent. Mushroom fanning is in fact a very easy job. There is an opportunity to make good profit by investing a little amount of capital and labour. One can earn Tk 4-5 thousand a month by investing only Tk 10- 15 thousand. The genus Trichaptum, an example of a polypore, a mushroom without a stalk, fruiting on a log. Main articles: Scorecard (fungi), Basidiocarp and Ascocarp typical mushroom are the fruit bodies of members of the order agaricales, whose type genus is agaricus and type species is the field mushroom, agaricus campestris. However, in modern molecularly defined classifications, all members of the order agaricales produce mushroom fruit bodies, and many other gilled fungi, collectively called mushrooms, occur in other orders in the class agaricomycetes. For example chanterellers are in the Cantharellales, false chanterelles like Gomphus are in the Gomphales, milk mushrooms and russulas as well as Lentinellus are in the Russulales, while the tough leathery general Lentinus and Panus are among the Polyporales but similar genera, are in the Hyenochaetales. Many species of mushrooms appear overnight, growing or expanding rapidly. This phenomenon is the source of several common expressions in the English language including “mushrooming” or “mushrooming” and “to pop up like a mushroom”. In actually all species of mushrooms take several days to form primordial mushrooms fruit bodies though they do expand rapidly by the absorption of fluids. Though mushroom fruiting bodies are short lived, the underlying mycelium can itself be long lived and massive. A colony of Armillaria ostoyac in Malheur National Forest in the United States is estimated to be 2400 years old, possibley older and spans an estimated 2200 acres. Most of the fungus is understand and in decaying wood or dying tree roots in the form of white mycelia combined with black shoelace like rhizomorphs that bridge colonized separated woody. Yellow, flower pot mushroom at various states of development. Local product is for our country consumption, we initially produce our local product as main product at the starting year. So this product is vary important for our company as well as serving the nation. Straw mushroom is only grown at summer season. Its is very notorious for health & consume little cost than bottom mushroom. This mushroom is very popular in our country as well as abroad. Its production is quit sensitive & costly. We can only produce this mushroom at winter season. All Season – Oyster Mushroom. Although it can produce whole year we emphasize a lot to here. Approximately our 60% production is in sector. It is very much suitable for our climate as well people of our country like it very much. Most of our business returns depend on this mushroom. After establishing a local market we are going to export our product in abroad. Our export product include our local type of product & some other product. This is a new type of mushroom we produce for only export.As our plan for going to export at third year of our business. So as form Bangladesh perspective we want bring some new concept in our product variation & bring number of others mushroom in future. Somewhat subjective judgment, a market area’s size and density has a profound impact on an analysis in terms of understanding demographic trends, demand estimates and the competitive environment. Population and Household Counts: The number of households in a market area is directly proportionate to its geographic size within an individual market. Total householders residing in a market area can greatly influence demand calculations. General Demographics: The socio-economic composition of a market area including income, household size, and tenure can be largely influenced by the erroneous inclusion or exclusions of non-comparable areas. Demand: Too large of a market area may result in overstating demand for a proposed development. Conversely, too conservative of a market area may discount the demand for new product, especially if a lack of quality housing currently exists. Supply Analysis: While a larger market area generally includes higher household totals, it likewise may include a higher number of directly comparable units. If using demand methodologies that net out recently constructed and comparable rental units from the demand estimate, the increase in the number of comparable units can outweigh the increase in dema. Location of Competitive Properties: A primary consideration in defining a market area is identifying those locations that offer alternative opportunities to a potential renter for a subject site. The managers of existing Comparable Properties near the site are excellent sources in determining those competitive locations. Accessibility: Available transportation linkages including both traffic arteries and mass transit options can influence the size of the market. Mass transit can have a significant impact on projects addressing very low income households for which transportation options may be limited. Natural Boundaries: Natural boundaries including rivers can restrict the movership within a market due to lack of accessibility. Market Perceptions: Whether grounded in reality or not, market perceptions can be a significant determinant of market area boundaries. Social stigmas often exist within sub-markets, with residents from one side of a submarket may not move to a close by neighborhood, regardless of housing opportunities. The construction of a new, attractive rental community may not necessarily relieve this perception. Target Market: Proposed developments targeting a special needs population such as seniors generally draw from a larger geographic region. Given the smaller pool of qualified householders, the location and quantity of comparable stock is of additional importance. An acceptable market area for a family oriented rental community will often be too conservative for a rental community targeting senior rental householders. Local Agency Service Boundaries: The geographic areas covered by local agencies, such as housing authorities, senior citizen centers, community-based organizations can be a strong indicator of market area boundaries, especially when the project has a community-based sponsor or co-sponsor. Non-geographic Factors, such as employees who might be expected to reside in a development as a result of planned or existing job opportunities and special needs households who are served by a multi-jurisdictional agency that covers communities that are clearly distinct market areas. To know our market strategy, we must define our market size. Otherwise we are navigating without a map. Objective: Understand the size, scope, competitive landscape, and complexity of our market. Benefits: Accurate market planning, financial forecasting, and communicating of market plans to employees, press, analysts and customers. Silicon Strategies Role: Define our market across multiple dimensions, mapping competitors, positions and market-force trends. SO from this above strategy we set our market size, as mushroom is new product in our country its market size is not big it is in a small size now .The higher class people & middle class people are in this market size. Number of lower level customer is higher than Mid and high level customer. Customers are unconscious about their health. SWOT analysis is a technique commonly used in business circles to assist in identifying strategic issues for a company or organization. If the analysis is to be applied to visualization products some modifications to the technique will be required, however, potentially it will yield useful information about the future viability of various systems. The predictive capabilities of the technique come about from the consideration of each system’s Strengths (S) and Weaknesses (W) in the context of the environment which is seen to present Opportunities (O) and Threats (T). The intention is to determine how each system will fare in the light of changes taking place around it. It accomplishes this by assessing an organizations strengths (what an organization can do) and weaknesses (what an organization cannot do) in addition to opportunities (potential favorable conditions for an organization) and threats (potential unfavorable conditions for an organization). Strengths and weaknesses are the internal factors of our business. Opportunities and threats are external factors that affect our business. By SWOT analysis first we have to find out our strengths and weaknesses of our business, and then we have to give high importance of our weaknesses to overcome those. For the future expansion we must find out our opportunities of our business that make our business more profitable. And at last but not the least we must find out our threats that comes form outside and we must alert from that threats. Consider our strengths relative to our competitors and from our customers’ perspective. First, most of the members of this organization are Microbiologist and they know better how to deal microbes than anybody else. Second, it bundles valuable features not found other companies. Third, paradigm’s mushroom can get more acceptances because of the professional affiliation of the members. For example, all our competitors may sell using the telephone, whereas we use direct face-to-face selling. Anything a customer wants that we provide and our competitor doesn’t, can be a possible strength. Strength is really meaningful only when it is useful in satisfying the needs of a customer. At this point, the strength becomes a capability for us. When writing down strengths, it is imperative that they be considered from both the view of the firm as well as from the customers that are dealt with. These strengths should be realistic and not modest. A well-developed listing of strengths should be able to answer a couple of questions. Firstly, Lack of Brand awareness and Image. Secondly, Already the market is grasped by other company. So at first we have to penetrate the market which is difficult. Thirdly, In addition there are broad macro environmental factors that effect paradigm’s product. Weaknesses should also be considered from an internal and external viewpoint. It is important that listing of a firm’s weaknesses is truthful so that they may be overcome as quickly as possible. Delaying the discovery of weaknesses that already exist within a company will only further hurt the firm. A well-developed listing of weaknesses should be able to answer a few questions. The role of the internal portion of SWOT is to determine where resources are available or lacking so that strengths and weaknesses can be identified. From this, the marketing manager can then develop marketing strategies that match these strengths with opportunities and thereby create new capabilities, which will then be part of subsequent SWOT analysis. An opportunity is the chance to introduce a new produce or service that can generate superior returns. Opportunities can arise when changes occur in the external environment. The external environmental analysis may reveal certain new opportunities for profit and growth. Paradigm can provide Mushroom in the cheapest way and safer then other company’s product available in the market. Yet increased competition complicates the situation. Threat is to control the contamination problem which is very common. It may seem easy for a technical person but the real condition may differ from the projected one. Managers who are caught up in developing strengths and capabilities may ignore the external environment like threats. A mistake of this magnitude could lead to an efficient organization that is no longer effective when changes in the external environment prohibit the firm’s ability to deliver value to its targeted customer segments. These changes can occur in the rate of overall market growth and in the competitive, economic, political/legal, technological, or socio cultural environments. Technological developments may make our offerings obsolete. Market changes may result from the changes in the customer needs, competitors’ moves, or demographic shifts. The political situation determines government policy and taxation structure. Producing mushrooms is not like raising your usual garden vegetables. But then, mushrooms aren’t vegetables. Mushrooms are fungi and do not contain chlorophyll, so while that means they don’t need sunlight; it also means that they depend on an especially nutritious growing medium. The first step in producing superior mushrooms such as those grown by Modern Mushroom Farms is to create an ideal growing medium. 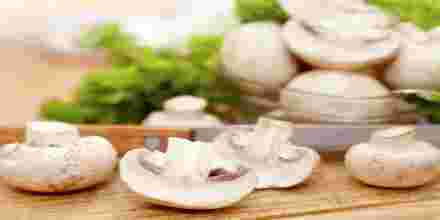 White, crimini and portabella mushrooms all grow well on the same medium. Pasteurized compost made from sources such as corn cobs, straw, hay, water and nitrogen supplements fill the trays in which mushrooms grow. At the same time, under laboratory conditions, mushroom spores are inoculated into sterile grain seeds to produce spawn that is planted in the compost trays. Once the spawn have produced a white network of mycelium, the mushroom’s equivalent of roots, the compost is covered with a thin layer of peat moss, or casing, and temperature (about 60 degrees F) and humidity in the mushroom house are controlled until tiny white rounds poke through the peat moss. This stage is called pinning and the farmer knows that in 17 to 25 days (3 to 7 days longer for portabellas), the mushrooms will be ready to harvest. The whole cycle takes from 9 to 12 weeks and since all the farming is done in dark, climate-controlled buildings, we can have fresh-from-the-farm mushrooms all year round. Some of the specialty mushrooms prefer slightly different growing conditions. Oyster mushrooms need a little more humidity and fresh air than the white and crimini mushrooms. The mixture of compost and oyster-mushroom spawn is placed in long, tubular plastic bags punched with holes and hung up or set in racks so air will circulate around them. After about 14 days the mushrooms poke through the holes and can be harvested. Shiitake mushrooms were traditionally grown on oak logs. These days they are produced by a process similar to that used for oyster mushrooms except oak sawdust is used in place of compost. Enoki mushrooms are grown in plastic bottles on a substrate of corn cobs, wheat bran and soy bean meal. They are held at 45 degrees F and harvested after about 90 days. Cultivated fresh mushrooms are in good supply year round. Look for firm, unblemished caps. The mushroom’s surface should be free from moisture but not look dry. Avoid mushrooms with any sign of mold. Always refrigerate mushrooms. Loose mushrooms keep well in paper bags in the refrigerator. Avoid airtight plastic bags because they will retain moisture and speed spoilage. Properly stored, fresh mushrooms will keep for five days or longer. Don’t clean mushrooms until you are ready to use them. To remove any bits of the peat moss in which they were grown, rinse quickly with cold running water or wipe the mushrooms with a damp cloth, paper towel or soft brush. Mushrooms may be cooked whole, sliced or chopped. The stems of shiitake mushrooms and the root end of portabella stems are often tough and should be discarded or used to add flavor to sauces and stocks, but all other mushroom stems can be trimmed and used along with the caps. Uncooked fresh mushrooms don’t freeze very well, but once they have been cooked, they can be frozen in small containers for a convenient, ready to use addition to soups, stews and sauces. Just clean, trim and slice the mushrooms; sauté them in oil or butter and cool to room temperature. Then, package in airtight 1/2-cup or 1-cup containers and freeze. They may be kept several months and are best if thawed in the refrigerator before use. Policy maker’s should be honest because most of the time they don’t keep their words. We must inform the people of our country about the advantage of using Mushroom. Supplying huge amount of Mushroom spawn. Edible mushrooms provide a good supplement to the diet in the form of proteins, carbohydrates, valuable salts and vitamins. It is mainly the Department of Agricultural Extension (DAE) that has introduced mushroom cultivation in Bangladesh in recent years. Cultivation of mushroom has opened a new opportunity of earning extra income for a good number of small, marginal and landless families. The greatest advantage for small, landless and marginal farmers is that mushroom cultivation does not need any land. It can be grown at the homestead or inside a house. Poor women can have extra income from cultivating mushrooms. Older and disabled people can also cultivate mushrooms in their homesteads. RIB was interested to support a research project on mushroom cultivation as income generation activity for the poor women of the rural area adjacent to Dhaka city. . This phase of the project will be devoted to identify the possible marketing points, extent of market demand, problems of the existing producers with respect to production and marketing, extent of use of mushroom by different restaurants and their sources etc. So, Bangladesh mushroom industry is consists of above big to little firm. There is a huge prospect of mushroom cultivation in Bangladesh. It can play an important role in eradicating malnutrition, one of the main problems of the people, and preventing diseases. By mushroom cultivation, it is possible to alleviate poverty and providing employment for educated unemployed, youths, adolescents and women.